When I think milk, I honestly think about how much I love it, but also how allergic my son is to it. We have become very strict with allowing food he's allergic to entering our home, so we don't allow milk in our fridge anymore because of obvious dangers now that he is older. So why am a fan of shelf safe milk? I can count on my family coming over with their shelf safe milk in their bags for the little ones in our family and keeping it in their. Our home stays safe. We all know how important it is to have milk in our diet, personally for me I thought I had to have some milk in my diet while I was pregnant and now that I am exclusively nursing so I was able to when I was out of our home. Milk on the go that I don't open or drink at home is great convenience. Milk was always a huge part of my diet growing up, and now considered a treat for me these days. Shelf safe milk makes getting nutrients that everyone needs easy. One carton of shelf safe milk has eight grams of protein and nine essential nutrients – calcium, A, D and B12, potassium, phosphorus, magnesium, riboflavin, niacin and zinc. You might be wondering what exactly is shelf safe milk? Shelf safe milk is real milk with no additives or preservatives that requires no refrigeration until it’s opened. Just Grade A wholesome milk. Makes it convenient to have milk anytime, anywhere. For us, family can come over with their shelf safe milk in their bags for the little ones, and my home stays safe for my son. For those without allergies, it is perfect for lunchboxes, diaper bags and purses, for on-the-go enjoyment. You can even freeze the single serving packages the night before and next morning toss it in your bag to have later as a healthy drink..for yourself or your kids. I love buying in bulk and I'd defintely recommend buying shelf safe milk in bulk to have on your shelf, in your pantry, or anywhere in your home. We always have dairy free milk in our pantry for our son, it is very convenient to not have to store it in the fridge. You save money, and you save many trips to the store. Also having healthy options around keeps the kids healthy. "It’s a hassle-free, convenient way to enjoy milk. It’s milk, unleashed." 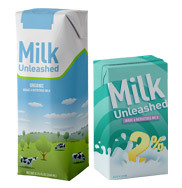 Learn more about Milk Unleashed by following them on twitter, and becoming a fan on facebook. You can find out where to buy here. *This blog post is part of a paid SocialMoms and Milk Unleashed blogging program. The opinions and ideas expressed here are my own. To read more posts on this topic, click here.